Melting snow doesn’t mean the end of beanie season! 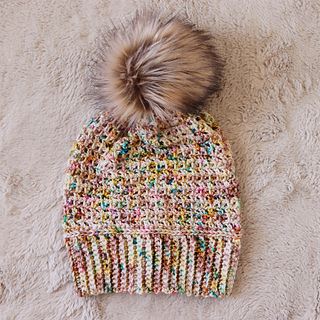 Make the Flower Child beanie, a lightweight slouchy crochet hat. Worked flat then seamed, this is the ultimate beginner-friendly beanie. And the best part?! It’s sized for the entire family, from size Newborn to Adult! -Pattern includes instruction for 6 sizes: Newborn, 3-6 months, 6-12 months, Toddler, Child, and Adult, including adjustments for slouch or fitted style. -Easy construction means it’s perfect for any skill level. -Uses a simple variation on a basic stitch to achieve an interesting mesh pattern. -A fun and fast one skein wonder! Original sample uses Hue Loco Merino Worsted. Substitute any worsted weight yarn - be sure to check your gauge first! US G/6 4mm and US H/8 5mm, or any size needed to obtain gauge.